A recent study found regular use of proton pump inhibitors (PPIs) for acid reflux raises the risk of stomach cancer. 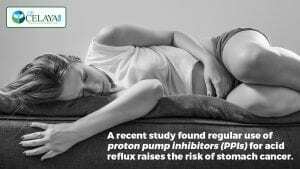 PPI users (Prilosec, Prevacid) in the study had twice the risk for stomach cancer compared to those who used H2-receptor acid reducing drugs (Tagamet, Pepcid). About 20 percent of Americans suffer with acid reflux and heartburn. Most people attribute acid reflux to excess stomach acid. However, the problem is too little stomach acid. 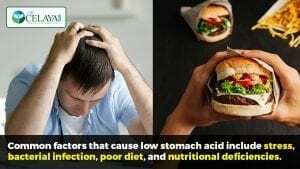 How does low stomach acid cause acid reflux? Want to know more? Schedule a FREE 15 minute consultation with Dr. Celaya. The stomach is highly acidic by design so that it can quickly break down foods and kill bacteria, fungi, and other pathogens. Good stomach acidity also helps absorb minerals and signal the rest of the digestive tract to release the right hormones, enzymes, and emulsifiers. Sufficient stomach acid is an important first step in ensuring overall digestion runs smoothly and that you are less susceptible to heartburn, indigestion, belching, gas, food allergies, bacterial infection, and abdominal pain. What causes low stomach acid? Common factors that cause low stomach acid include stress, bacterial infection, poor diet, and nutritional deficiencies. However, an H. pylori infection, which is linked to stomach ulcers, is the most common cause of low stomach acid. Other factors that play a role in low stomach acid include hypothyroidism, pernicious anemia, and deficiencies in zinc B12, magnesium, or chloride. People who have been vegetarians or vegans for a long time may be deficient in zinc and B12, which are abundant in meats. In order for the small intestine to receive food from the stomach, the contents must be acidic enough to trigger that passage. When this fails to happen, the food shoots back up into the esophagus. Although the food is not acidic enough for the small intestine, it is too acidic for esophageal tissue. This is what causes the burning of acid reflux, or heartburn. 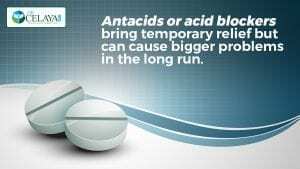 Antacids or acid blockers bring temporary relief but can cause bigger problems in the long run. Without stomach acid to trigger the release of enzymes, digestive hormones, and emulsifiers, nutrient absorption suffers and the digestive tract is more prone to infection, inflammation, and damage. The first thing to do with low stomach acid is address the root cause. As we age, stomach acid naturally decreases. You can boost stomach acid by taking a supplement that contains betaine hydrochloric acid (HCl). However, if you have stomach ulcers or stomach autoimmunity (when the immune system attacks and destroys tissue), supplementing with HCl could make you worse. In these situations you need to address the existing condition first. If you would like to get to the root cause of your heartburn, you can schedule for a free consultation with Dr. Celaya.